In our house Father’s Day is a rip-roaring celebration, so preparing hearts for this day is important to our family. Dad serves us all year long and we take the opportunity to repay a fraction of his efforts by serving him for the whole Father’s Day weekend. The kids and I start with making coupons. You know, the usual “Wash Your Car” and “Sweep your Office” kind of coupons. But we insist they be used within 48 hours. We are ready to fulfill every Father’s Day promise and then some. To prepare for this big event, I sit down with the kids about a week before and we talk about our plans to make it a restful, peaceful, loving day of appreciation for Daddy. They share their ideas and we make our plans. What we will feed him, what gifts (if any, as it’s not really about the gifts) we will get him, ways we can show him how much we care about him. I make a shopping list, we make coupons and cards and we spring into action. Also, be sure your children have a Bible they can use when preparing their hearts for their father. “The Nature Bible” is a great, durable one for kids! By the time Father’s Day weekend arrives we are primed and ready to set our needs aside and honor the man that gives his life for us every day. It’s breakfast in bed, his favorite snacks, and foot rubs. We do all of our work and as much of his work as we can. He’s not allowed to lift a finger. Father’s Day doesn’t have to be just about gifts. Showing him you appreciate him is the best Father’s Day you can give! Gifts are not the only way to express love and appreciation on Father’s Day for all dad does. 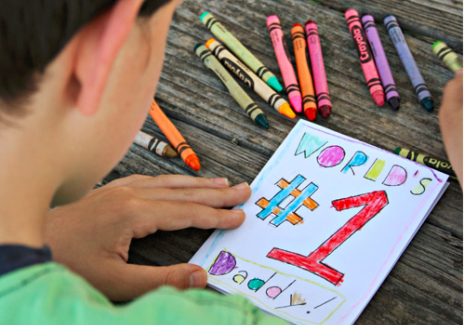 What are some of the ways you show dad love on Father’s Day? Leave a comment and we’ll share your some of your responses on our Facebook page!